As a member of the Gideons International, there are numerous types of Scriptures which I can order. The vast majority of these Scriptures are intended for evangelism purposes. There are a handful of Bibles, however, which are for personal use. One of these is a brown leather Bible which, according to the website, is carried by many Gideons. I purchased one of them late last year and I decided to write a review of it. When I use the word “leather,” I really mean it. The color is a “chocolate brown” with gold fringe on the pages. 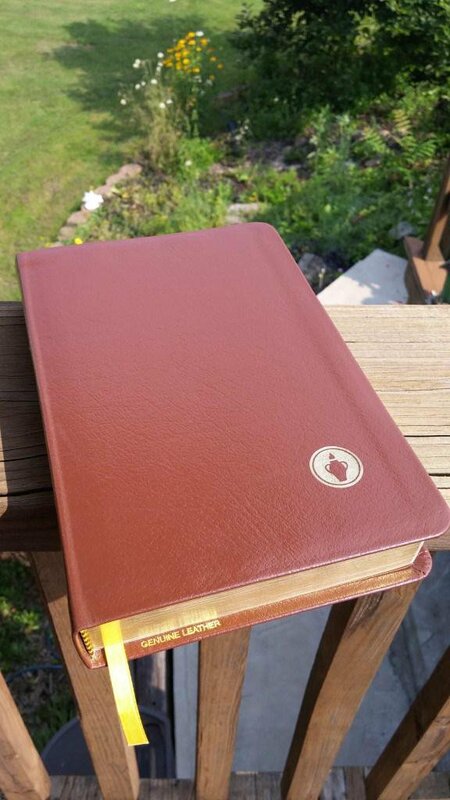 When most people receive a Gideon-produced copy of the Scriptures, it’s usually made of the imitation leather material used in their evangelistic copies. The reason for this is cost. A Personal Workers Testament (PWT) in the KJV only costs $1.35 for this reason. That’s great if you’re handing out PWTs on a college campus or something like that, but not for a personal Bible. That’s why I was so pleased to see this particular copy they produced was made of genuine leather. Note the phrase, “personal Bible.” It’s size is decent, but it’s definitely not the size of a family Bible or even a “preaching Bible.” I believe it was designed mainly for devotional use or just general reading. True to this point, there are no marginal notes or cross references within the text. Its approximate size is 5.5″ x 8.25″ x 1.25″ to be specific. No font size is listed either on the website or within the Bible itself, but my guess is that it’s roughly 10-point. For some people this may not be adequate, but I think this is a decent font size given the relatively compact nature of the Bible itself. Cost – At $24 per copy, that’s a price that can’t be beat for a medium-sized leather Bible. Quality – I’ve been using it almost exclusively for over six months now and I have yet to see any kind of serious wear or tear. Granted, that’s certainly not long-term use, but it definitely seems to be well made. Simplicity – Some people will object that there are no notes or cross references, but I think that’s part of this Bible’s strength. There are times when study notes and things like that tend to get in the way of a good, devotional reading. “Floppage” – In terms of “floppage” (I didn’t coin that term), it tends to rank very poorly. If you’re not familiar with that term, a Bible’s “floppage” refers to its ability to lay flat when opened to a given page. With this particular Bible, you’ll have to use both hands to hold it open unless you happen to be reading through the Psalms or some other section in the middle. Exclusivity – Unfortunately, only members of the Gideons International are able to order this Bible (and that’s true of all their other materials). Even so, you can still obtain a copy if you happen to know a Gideons member (more on this below). Outside of the positives and negatives, there’s not much else which can be said. There’s a golden Gideons emblem stamped on the lower right corner of the front cover. Inside the Bible, you’ll find the usual things you’d expect to find in a Gideon Bible: a basic Gospel message with Scripture proofs, John 3:16 printed in various languages, and various Scripture helps. It also comes with a yellow ribbon to mark your page. I recommend this Bible for use as a simple, devotional copy of the Scriptures. It makes a great gift as well, especially for someone who has never had a nice Bible before. As a service to my readers, I’m willing to purchase a copy on your behalf should you desire it. So please contact me if you’d like a buy a copy. I won’t be making any profit on this whatsoever. My desire is simply to meet the needs of those who are without a quality Bible. Hope you were blessed by this review! This entry was posted in books, reviews, Scripture. Bookmark the permalink. Hi Josh – Where can I get hold of you regarding the offer in the final paragraph? Just following-up on my previous comment that is awaiting moderation. I’m just wondering where I can get a hold of you into order to get a copy of the Gideons personal bible? I’ve been advised that my e-mail address may not be receiving incoming e-mail so well, so if you have tried to reply and not heard from me, this is why. Please try the alternate address I have listed below. Hi there. I appreciate you asking about the Bible. My membership renewal is in limbo right now, so I may not be able to order anything for awhile. I’ll let you know if/when I get it reactivated. Thank you for your time and patience! I’m a new Gideon Member. I plan on purchasing one soon. You rated it at 10 point font. How big is that? I would love to order a copy from you. How can we make that happen?